Botulinum toxin (BTX) is produced by Clostridium botulinum, a gram-positive anaerobic bacterium. The clinical syndrome of botulism can occur following ingestion of contaminated food. Since 1989 BTX is used therapeutically, first for neurological and ophthalmic disorders and later cosmetically (April 2002 FDA approval for wrinkles). Botulinum toxin acts by blocking impulse transmission from a nerve to a muscle to limit muscular contraction. Cosmetically it is used in areas in which repetitive mimetic movements produce the wrinkles, such as between the eyebrows, on the forehead, around the eyes, etc. The effect of BTX is time limited, lasting between 3-6 months. During this time the nerve recovers by sprouting of new nerve branches to re-innervate the muscle. Therefore, any side effects occurring after BTX injection are transitory. Why “bad things happen” while injecting BTX? Some complications are related to the inherent features of the product, while others are due to bad injection technique, and some are unpreventable. The most common side effect of BTX injection is bruising at the site of the injection. Stopping any unnecessary blood thinners prior to the treatment and skin cooling afterwards can minimize this. Other reported adverse events from cosmetic use of BTX include headaches and flu-like symptoms. Their pathogenesis is not elucidated. 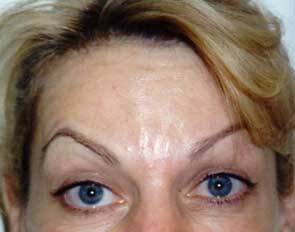 “Mephisto look” with hyper-elevation of eyebrow tail is due to hyperactive frontalis muscle (Figure 1). Injection of BTX to lateral frontalis, will re-balance the eyebrow position. Unintended spread of the toxin to the adjacent muscles can create their weakness and affect temporarily facial expressions or functions. Bad injection technique or muscle manipulation immediately after the treatment can cause toxin spread. 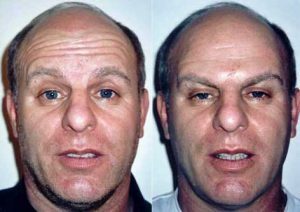 For example, eyelid drooping is caused when toxin is injected to treat the glabellar complex (Figure 2), eyebrow ptosis can be induced by forehead wrinkles injection (Figure 3), “botox smile” can result from crows feet treatment. The incidence of these adverse effects is less than 5%; they are usually of very mild intensity and always time limited. 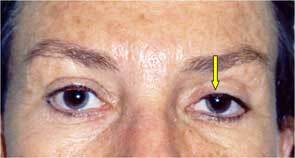 Iopidine eye drops can be effective in treating eyelid drooping. In spite the fact that not a single case of fatality after injection of the approved BTX solution for cosmetic purposes had been reported to the health authorities, the FDA announced in April 2009, that a box warning would be added to the labeling of toxin products. The warning includes potential side effects, such as difficulty breathing, difficulty swallowing, muscular weakness, double vision, or respiratory depression. To print, please download this PDF file.